DR K N KRISHNASWAMY M.E, PhD (II.Sc.) retired as Professor of Management Studies, Indian Institute of Science, Bengaluru. He worked in the areas of Operations Management and Creativity, and guided many research students for their PhD; did research projects for the Department of Science and Technology, Govt of India. Author of the books Research Methodology in Management, 2006 and Case Studies in Operations Management, 2007. He has a deep interest in Vedanta, Yoga and Bhagawad Gita. Founder Member Atmabodh, Center for Learning and Healing, Bengaluru. RAJ KUMAR DHAM B.E.,D.I.I.Sc; MD(AM) Motivational Trainer and Founder Member Atmabodh, Center for Learning and Healing. He is alumnus and guest faculty at I.I.Sc. He worked as Head of Management Services Department of Bharat Electronics Ltd., Ghaziabad. He is Trustee of People's Trust, an NGO which has adopted 18 villages for total development. Trustee Institute of Health and Cosmic Harmony, dedicated to spreading Holistic Health Movement. Entrepreneur, Trainer ,Yoga Master, Holistic Health and Wellness Promoter. Fellow Member International Yoga and Meditation and Top Contributor Indian Leadership Group. His book Your Back is the Backbone of your Health was published by the Institute of Health and Cosmic Harmony, 1996. Was awarded Gold Medal by- IHMA for his contribution to the society for the cause of Holistic Health in 2001. 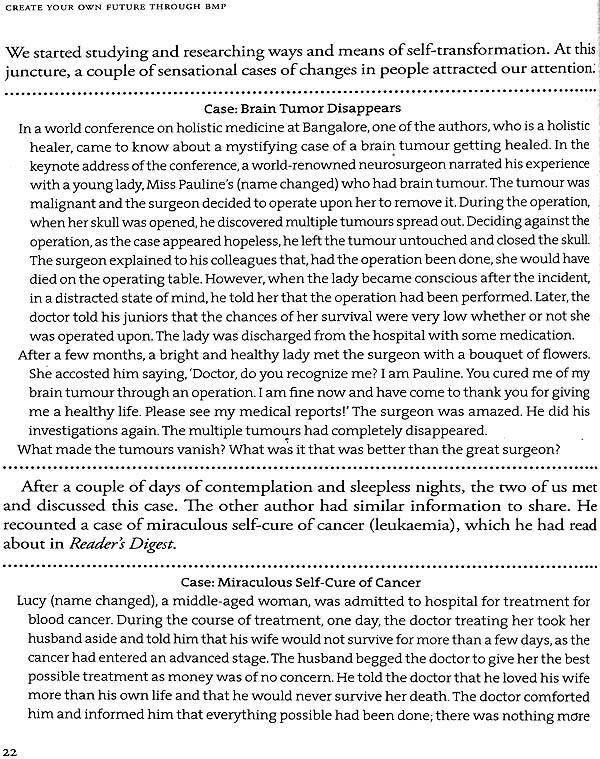 I have personally known the authors - Dr K N Krishnaswamy who retired as professor of management studies at the Indian Institute of Science Bangalore and his student Raj Kumar Dham, an entrepreneur interested in healing and yoga - for nore than two decades. Professor Krishnaswamy has guided many research scholars and published many papers and books; he has keen interest in Indian Vedantic philosophy and wisdom and has been working towards 'creative problem solving'. Raj Kumar Dham has keen interest in healing and yoga and has been promoting holistic health and yoga in Bangalore since 1986. 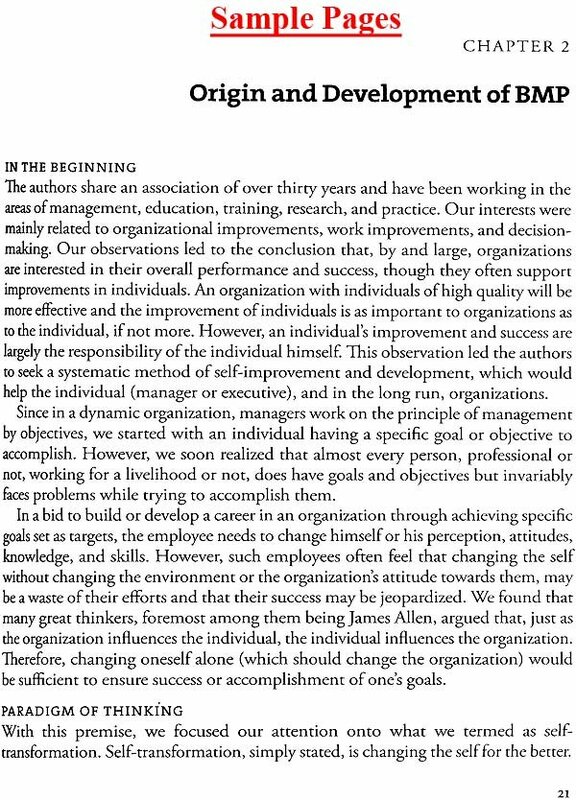 The authors felt the need for designing a self-development method aimed at successful and satisfying career and enlightened living for the individual. Their studies and research in the art and science of self-improvement led to the concept of programming the 'inner human computer' and thus developed BMP as a new method of self-transformation. 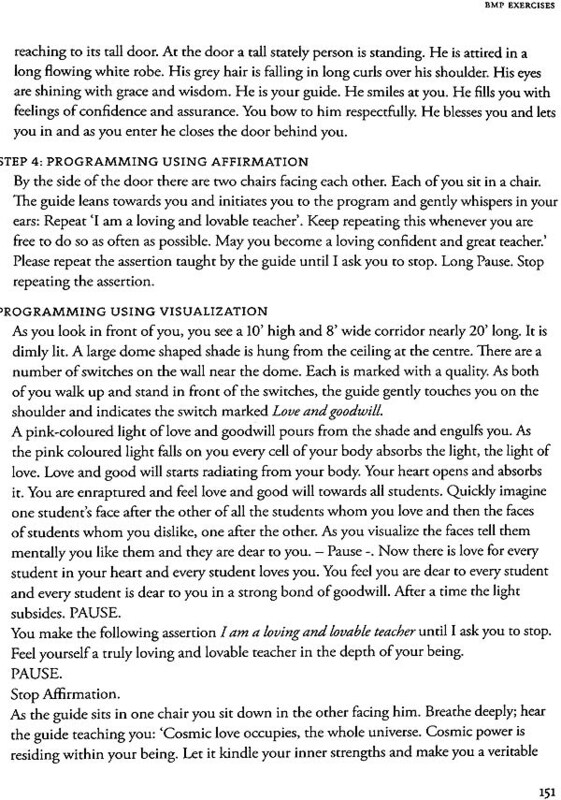 The BMP practice developed by them is quite different and unique as compared to other practices like NLP. According to the authors, for achieving one's goals one has to change one's habits and attitudes and acquire the required knowledge and skills and BMP helps in this. 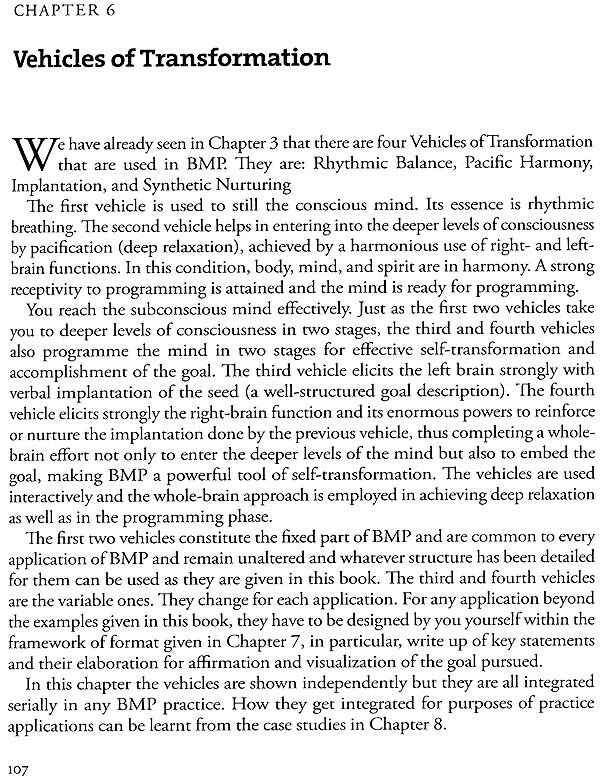 For programming the inner computer the authors developed four BMP vehicles, namely Rhythmic Balance, Pacific Harmony, Goal Implantation, and Synthetic Nurturing. These vehicles use relaxation, breathing, affirmations, and visualization techniques and left and right brain programming. These BMP vehicles developed by them are unique and by using these vehicles we can create the goal- oriented desired experience to change the programmes or impressions stored as engrams in the neural network. They have termed this synthetic Experience'. This synthetic experience provides virtual reality and forms the core of BMP and has tremendous power of application in almost all the areas of life. I feel they have added a new chapter and thinking in self- development through seIf-transformation and their valuable contribution will be hailed by many. I have been in constant touch with them since 1998 throughout the development of BMP and appreciate the tremendous hard work that has gone into designing and testing it. Their work has been published in leading journals like Bhuvan of Baratiya Vidya Bhavan and Life Positive. They have also presented their work at two international conferences. They have conducted programmes for the public and institutions to get feedback from a large number of people in India and abroad. Based on the feedback they incorporated necessary changes. This has made their book practical and useful. The authors have developed the basic frame work of the BMP methodology covering the principles and philosophy of BMP. I agree with them that 'Self -Change alone is sufficient' and 'Self transformation is a journey' and BMP is an accelerator in accomplishing desired life goals. Their work needs to be taken further through research to enrich and expand it so that it becomes a powerful tool in shaping the life of millions of people. I am delighted to learn that even before the release of their book, one of the largest and most prominent hospital chains in India has shown interest in their BMP for Holistic Health and they have been requested to train their staff in it. I congratulate them as this will provide them a great opportunity for learning and research studies. This book will be of great value for the general public interested in fashioning their future through self-development and living an enlightened life. It will inspire thinkers, trainers, and researchers interested in the science of success and holistic living to take BMP further. 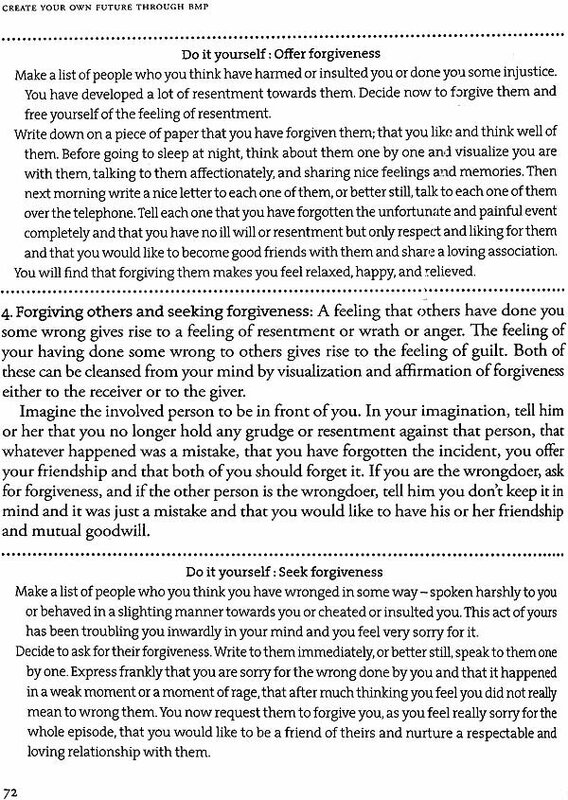 T his book is based on original research done over the past fifteen years in our attempts to develop a new paradigm, thinking, and methodology for effecting desired changes in an individual's behaviour, attitude, and habits to enable him/her to achieve his/her life goals and excellence. We have named the technique developed by us 'BMP' - Body-Mind Programming. It is a systematic seven-step technique predominantly based on the mode outcome thinking. BMP is an outcome of the coupling of ancient Indian and eastern wisdom with western scientific thinking. The technique has been tested on a good number of people individually and in workshops conducted by us for leading universities, institutions, and the general public. We have also tested the technique in workshops conducted for people from Taiwan, Jordan, and USA. 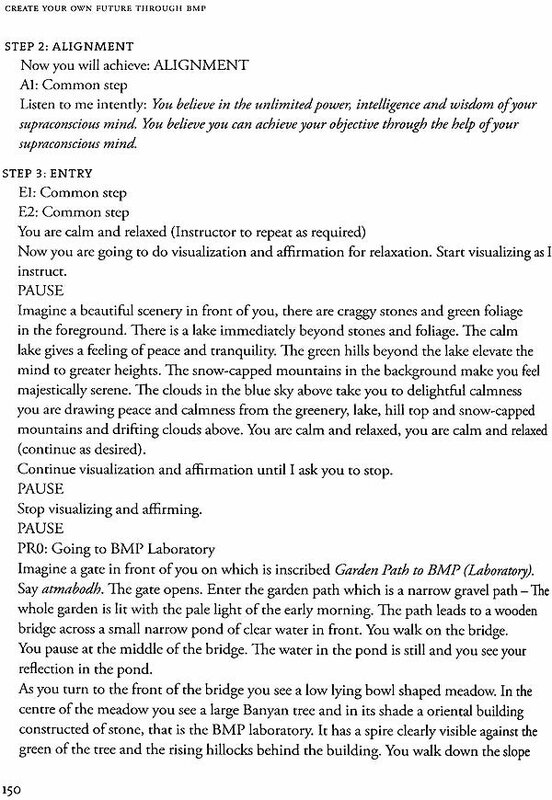 The special feature of the book is that it contains seven illustrative examples of BMP practice, detailing each step elaborately for ease of practice. 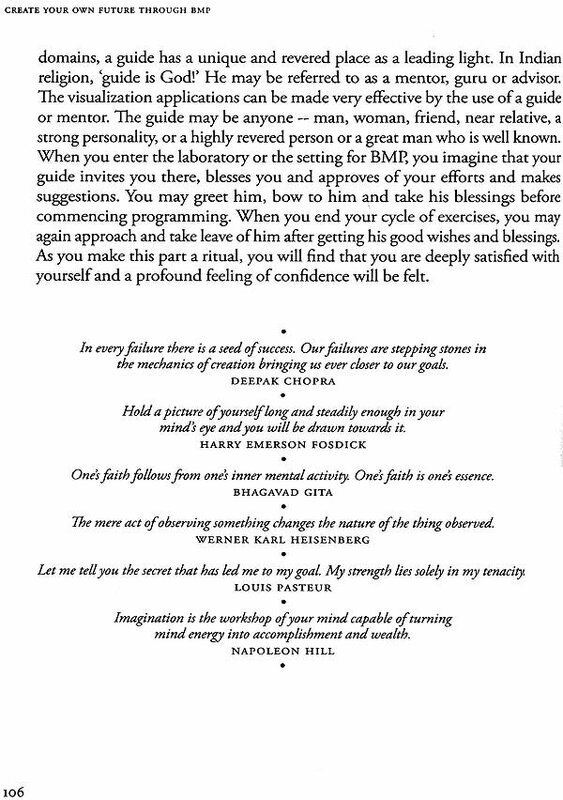 Application of BMP to seven specific aspects of life for enlightened living is also presented through a BMP chakra. Application of BMP to creative problem solving is also discussed. Body-Mind Programming (BMP) is a set of principles, thoughts, and techniques for achieving self-change that is aimed at accomplishing our intensely desired ideal in life. It is a modus operandi for success in our attempts to go from where we are to where we would strongly like to be, to what we avidly want to be, and what we keenly desire to accomplish. It is a systematic method developed to induce changes in ourselves gradually, to be able to and to actually do what we keenly desire. It is a harbinger of success in changing ourselves efficiently and effectively to move towards our goal. Body-Mind Programming (BMP) is about tuning the resources we possess - body and mind - to create a new way of living. In this new way of living we accomplish our goals whatever they may be. The core of BMP is the third rule, but it should always be accompanied by the other three. The world in which each of us lives as individuals is changing all the time. Scientists tell us that the magnificent human body changes every moment. Some cells die and some are born and so every part is changing at some time or the other. The experiences we undergo continually change our body, mind, emotions, and behaviour both consciously and unconsciously. Some of these changes are brought about without voluntary effort and some with, some willingly on our part and some against our desire and will. When desired changes take place, they bring about pleasure, and when undesired changes take place, they bring about pain. It is therefore easy to see that there is a universal urge for bringing about desired improvements and considerable time and effort are spent by us to bring them about in our pursuit of happiness. These voluntary efforts mainly consist of decisions taken by us based on our emotions, beliefs, and values and may be inadequate or inappropriate. We consciously or unconsciously use corrections derived from experiences of earlier decisions. We only need to make correct -decisions more often. The urge for self-improvement is at different levels and is addressed in different directions depending upon our perceptions and needs and the level of those needs. 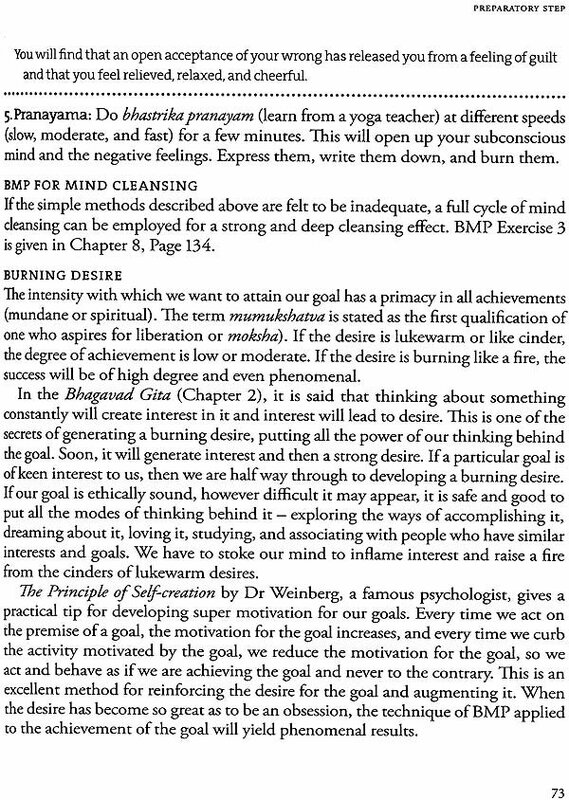 This aspect is well classified by Maslow in his theory of motivation. According to him, motivation for work of any kind stems from the hierarchy of needs - physiological (food, clothing, and shelter), safety (security from danger, threats, and deprivation), social (esteem) and self-actualization (accomplishment). It may be argued that changes within an individual may not be the only requirement for accomplishing happiness, or for that matter, any of his objectives. There is the environment to be dealt with and there are situational forces impinging on man's abilities, which inexorably alter the course of his life. All people, at some point or the other, feel the influence of what is generally termed as fate or destiny. We as authors, however, do not subscribe to the inexorable power of destiny argument, as we align ourselves with seers like James Allen who firmly assert that man has as much influence on the environment as the environment has on him. When man chooses to transform his body and mind, then the situation alters in tune with his transformation. Indeed, all along, his situation was in a way created by his mind being in a particular state or condition and he was truly the arbiter of his own destiny. It is with this thesis in our mind we propose that any human accomplishment is possible with appropriate self-transformation alone. In this, the technique is different and unique from other methodologies available for self-improvement. Enchanting Scents: The Secrets of Aroma Therapy Fragrant essences that stimulate, activate and inspire body, mind and spirit.